Dissecting the Varied Phenomena Around! A "budding" HR professional who is opinionated, observant and loves the umpteen novelties that the surrounding horizon provides..!! My recent visit to CEPT University, saw me in a campus that reminded me of IIM Bangalore. The long entrance, the open grounds, the pillared hallways, the Nescafe shop .. and as I entered further, stood the various blocks which housed different departments. The not-so-tall buildings did not read magnanimity, depth and wonder unlike the extraordinary work being carried out inside them. Further there was a small field used for cultural and sports activities with average or no infrastructure but if looked beyond then it sported an open culture while let creativity, independence and thoughts flow easily. The physical environment of the campus was like the "Tip of the Iceberg." 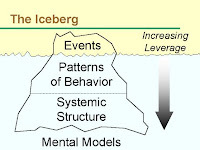 It took me back to the popular Iceberg model which extensively applies to various fields like Marketing, Training, Psychology, Culture where the underlying concept states that what is visible is actually a very small part of truth but the actual truth is submerged and is either difficult to observe or is hidden. But it is the invisible portion that triggers the actions and behaviours. Like the different levels of an iceberg, deep beneath the patterns are the underlying structures or root causes that create or drive those patterns. At the very base of the iceberg are the assumptions and worldviews that have created or sustained the structures that are in place. The important thing is that in solving problems the greatest leverage is in changing the structure - applying deep ocean currents to move the iceberg, which will change the events at its tip. In other words, we must have the ability to look beyond the obvious, analyse past the tangible, understand more than normal, believe more than told. We must be able to have a 360 degree view of our surroundings so that our opinions are based on facts, information and has lesser elements of biases. Latent Noises - Free Blogger Templates, Free Wordpress Themes Designed by: Small Potato presents HD TV Watch TV Online. Unblock myspace proxy.